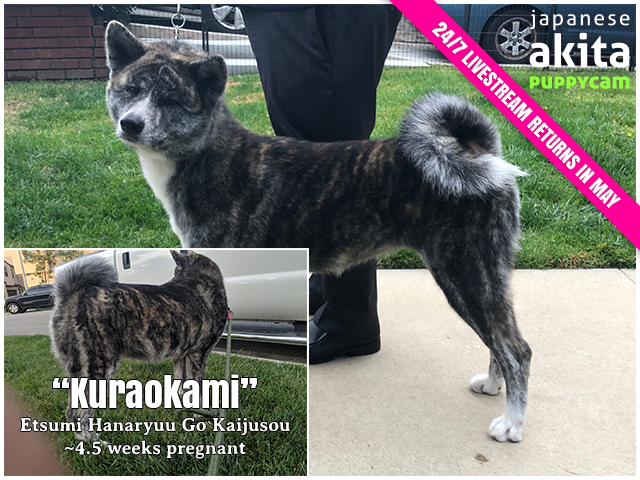 Kuraokami’s litter is due in a few weeks! We’re holding a guessing game again for anyone who wants to participate. You can make a prediction about the puppies – their date of birth, colors, and sexes. You may make as many guesses as you want. Each category is worth a certain number of points, and the player with the most points wins! Kura’s expected due date based on ovulation and breeding is between April 26th and May 2nd. All three colors are possible – red, brindle, or white. We will announce the winner(s) after the puppies are born. Please make sure you enter a valid email address so we can contact you if you win. You may optionally make a $5 contribution after you’ve made your prediction. Make sure you include a note letting us know who you are so we can match it up with your entry. See below for details! The entry (or entries) worth the most points wins. There are no negative points; if a category is way off it is worth no points. Contribute to Litter H and Win! If you like, you may make a $5 contribution towards Litter H along with your prediction. (Limit one prediction per $5.) The player with the closest prediction who made a contribution will receive an Amazon gift card worth 50% of the total contributions. They may instead choose to have a donation made in their name to JACA Cares, a non-profit aid to Japanese Akita rescues, for the same amount. The rest of the contributions will go towards whelping supplies, puddle pads, blankets, toys, and other items for Kura’s puppies. 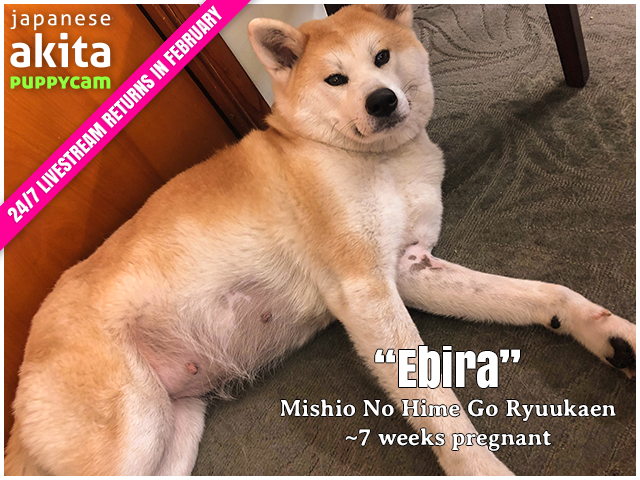 Ebira’s litter is due in a few weeks! We’re holding a guessing game again for anyone who wants to participate. You can make a prediction about the puppies – their date of birth, colors, and sexes. You may make as many guesses as you want. Each category is worth a certain number of points, and the player with the most points wins! Ebira’s expected due date based on ovulation and breeding is between January 29th and February 2nd. All of the puppies will be red – no brindle or white. Contribute to Litter G and Win! If you like, you may make a $5 contribution towards Litter G along with your prediction. (Limit one prediction per $5.) The player with the closest prediction who made a contribution will receive a PetSmart gift card worth 50% of the total contributions. They may instead choose to have a donation made in their name to JACA Cares, a non-profit aid to Japanese Akita rescues, for the same amount. The rest of the contributions will go towards whelping supplies, puddle pads, blankets, toys, and other items for Ebira’s puppies. If you need to reach us, please contact us at our new address. Remember, if you have any questions about our home environment or wish to meet our dogs, you will need to get on our waiting list and schedule an appointment. Please no drop-ins, thank you. 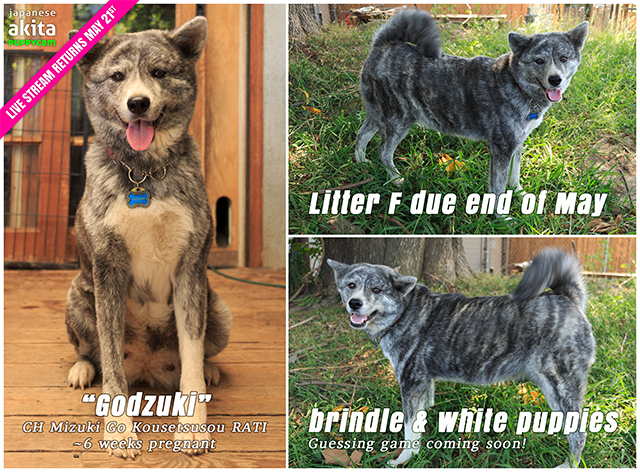 Godzuki’s litter is due in a few weeks! We’re holding a guessing game again for anyone who wants to participate. You can make a prediction about the puppies – their date of birth, colors, and sexes. You may make as many guesses as you want. Each category is worth a certain number of points, and the player with the most points wins! Godzuki’s expected due date based on ovulation and breeding is between May 21st and 26th. Each puppy has a 75% chance to be brindle and 25% chance to be white – no red. You may optionally click here to make a $5 contribution after you’ve made your prediction. Make sure you include a note letting us know who you are so we can match it up with your entry. If you like, you may make a $5 contribution towards Litter F along with your prediction. (Limit one prediction per $5.) If the player with the closest prediction made a contribution they will receive a PetSmart gift card worth 50% of the total contributions. The winner may instead choose to have a donation made in his or her name to JACA Cares, a non-profit aid to Japanese Akita rescues, for the same amount. The rest of the contributions will go towards whelping supplies, puddle pads, blankets, toys, and other items for Godzuki’s puppies. Godzuki and Toramaru mated this morning. Pregnancy check in one month with puppies due late May. Puppies will be brindle, with a chance of white! Please fill out our puppy questionnaire if you’re not already on our list. If you have any questions about this litter feel free to contact us. Welcoming a puppy into your home can be both an extremely exciting and highly stressful experience. We have added a new page to our site with detailed recommendations and a printable checklist to make it easier for new puppy owners. Click here to read more!